Looking for a real Australian farm experience? Every year we have backpackers come from all around the world to join our family farm. We pride ourselves on being fair and helpful to our staff and every year we have many return workers, which we believe is a testament to our friendly approach to farming. 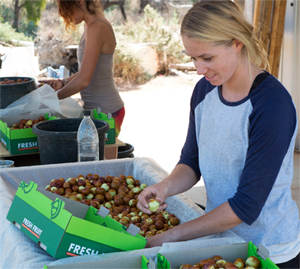 We never use labour contractors and all of our employees are hand picked, just like our jujubes! That way we can ensure a fair day’s pay for a fair day’s work. You will help us pick our jujubes from our beautiful jujube trees whilst the parrots and kangaroos watch on. All in the heart of the beautiful Australian countryside near Mildura, Victoria. Our season runs between February and April – to apply simply send us an email. I worked for Bernard between February and June 2015. He helped both me and my girlfriend with all of our paperwork and went way beyond what you normally expect from a farmer. Not only did he help us with our car registration, he also gave us a place to stay when our car got broken into. He made our farming experience the best that it could be and you could see that he really cared for the conditions that we all worked under. Highly reccommend! For three years in a row I worked for Bernard and always enjoyed the harvest time. To work on the little farm it’s like to be part of the family and a good opportunity for backpackers to get a new point of view about this beautiful country. The nice working atmosphere and conditions make this time to one of the best experience on my travels. The Murray River it’s just minutes away and perfect for fishing or canoeing.